Disclaimer: Feeding sharks is an inherently dangerous activity which should not be undertaken without sufficient professional training. Even after such training it is possible to be seriously injured or die as a result of shark feeding activities. The information contained within Elasmodiver is not intended as a replacement for training by a qualified agency and is presented merely as an introduction to the styles of shark feeds that take place and the ethics and politics surrounding the sport. The theory goes that by feeding sharks in the presence of divers or snorkellers, over a period of time the sharks begin to associate the presence of humans with food; effectively a Pavlovian response in which the sound of splashing humans or a boat arriving acts as a dinner bell to passing sharks and sends them into feeding mode. Then, unable to find the fish scraps usually on offer or perhaps confused by the low visibility where beachgoers regularly splash around, the sharks home in on the bathers and attack. We are not allowed to feed bears, crocodiles, or lions because it encourages them to seek out humans which can lead to similar problems so why should we allow people to feed sharks? Even if this hypothesis is unfounded, 'better safe than sorry' right? This is such a clear and simple argument that it is very easy to buy into and difficult to disprove. There is absolutely no proof that the small number of sharks participating in shark feeds around the world are responsible for any of the attacks that have been inflicted on bathers. Often attacks come from shark species that are not even in regular attendance at the feeds. Air patrols along Florida's busy beaches (a state in which shark feeding is now banned) have photographed hundreds of sharks milling around in the shallows among completely oblivious beachgoers. It would seem likely that any of these sharks could attack given the right stimulus such as the thrashing movements of a swimmer or the flash of a bare leg in murky water. At some of the most notorious of Florida's beaches, fishing piers are located next to prime bathing spots where recreational fishermen bait the water constantly. This introduces blood and fish scraps into the mix of splashing beachgoers, which in murky water creates a confusing signal to passing sharks. 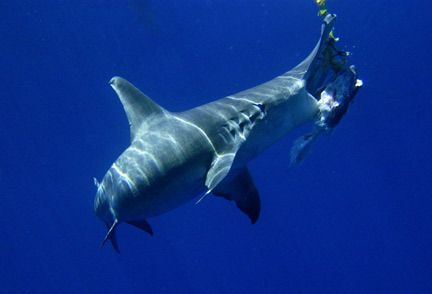 Shark feeding proponents also point out that during the majority of feeds, individual sharks receive very little food. Therefore, they do not learn to rely on humans for providing their meals. It is also practically unheard of for a spectator at a shark feed to get bitten. Divers at these events are largely ignored by the sharks which demonstrates that the sharks are able to differentiate between humans with food and those without. This learned behavior may actually decrease the chances of one of these sharks attacking an innocent bather. Occasionally through the clumsiness of the feeder or the shark, he or she may receive a bite but even in this instance the offending shark is not trying to eat the feeder but rather it is attempting to get at the fish. The same is usually true when spear fishermen are harassed by sharks. The added vibrations of a struggling harpooned fish can make the sharks very aggressive. A Great Hammerhead chomps on the bait. Comparing the behavior of bears, lions, and crocodiles to sharks is misleading at best. Large terrestrial carnivores share their environment with humans and naturally include us in their diet. Most sharks eat fish and do not consider mammals as food. If the debate were over the feeding of Saltwater Crocodiles which are responsible for many deaths in Australia there would be little ground on which to argue. Even approaching a Salty without food is asking for trouble as humans are firmly on its menu but as any diver will tell you; getting close to a reef shark in the wild is almost impossible (unless you corner it which is reasonable provocation for it to defend itself). Larger Great white sharks and a few other species do regularly eat mammals but in areas where Great white sharks and humans meet (such as the beaches of California) no operator would dream of trying to attract sharks (except perhaps unscrupulous fishermen). In December 2003 an operator in False Bay, South Africa was recorded chumming white sharks close to a popular beach. His excuse was that he was trying to draw the sharks away from the beach. His license was immediately suspended and the practice stopped. 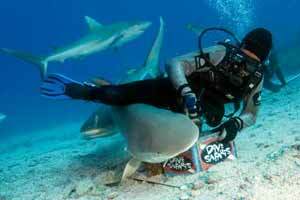 There is also controversy over the environmental ethics of shark feeding. To suggest that the primary goal of shark feed operators is to educate people and protect sharks through heightened awareness is unrealistic. Of course these feeds exist to line the pockets of dive companies but why should this be considered a negative thing? Many shark feeders are ex-fishermen who are progressive enough to understand that a live shark is worth much more than a dead one. If they happen to set up an operation where shark conservation and education are part of the program then that's even better. Does the feeding of sharks change their behavior? Most definitely but not drastically. Regularly fed sharks will appear on queue at the sound of the approaching feeder, but after devouring a few scraps to the delight of the spectators the sharks return to their normal activities of hunting and making baby sharks. The only time when their guaranteed appearance becomes a problem is when long-liners target the location of a feed. Then, the entire local population can be wiped out in one foul swoop. If you still haven't picked a side of the shark cage consider this: The oceans have been dangerously depleted. A recent IUCN survey confirmed that two out of five ocean organisms are now considered threatened. If a byproduct of shark feeding is a small level of protection for the remaining apex predators then shark feed operators are one of the few groups standing in the way of a complete ecosystem collapse. Its not compulsory to feed sharks to protect them but who else will champion these animals? Organizations like the Shark Trust are stretched too thinly already to concentrate on individual reef shark populations on the other side of the world and shark fishing bans are very hard to enforce. If shark feeders are out there monitoring the sharks and lobbying for greater localized protection (as they have in the Bahamas) then sharks have a better chance of avoiding extinction which will significantly help the crumbling ecosystem to maintain its fragile balance. One more point: if shark feeding is banned the images contained on websites like Elasmodiver could not be captured and without pictures, sharks become faceless monsters. Shark feeds are often the only way photographers and film makers can capture images that the public use to process their fears which helps them relegate sharks to the rank of dangerous predators rather than creatures of nightmare to be dispatched at the first opportunity.